Woman’s hair is her crowning glory, whether you see a woman’s hairstyle; under the bright spotlight or in mere shadow. Best hot air brushes are a great way to dry and style your hair at the same time, giving you a convenient way to get ready. The only issue is that there are dozens if not hundreds of similar products to choose from, making it hard to find the right one. This list will show you The Best Hot Air Brushes for hair; hence you don’t have to do research. What Features to look for while choosing the Hot Air Brush? #1. Heating Barrel: The heating barrel is responsible for heating up hair by creating the desired style. The best option is to pick a model with a ceramic barrel. Since it transfers the heat better, letting you effectively lock in the hairstyle. Some models have a removable barrel, to make storage easy but it matters for personal preference. Even the best barrel must distribute heat throughout your hair uniformly. This allows you to achieve awesome results without damaging your hair. A final consideration regarding heat is the ability to change temperatures. #2. Ease of Use: To find the right hot air brush, you need to know which features are the most important. The brush you choose should be easy to use, but since most of these items are used in a similar way, this is not typically a large concern. #3. Grip: When using the hot air brush, you will find it easier if the model is easy to grip. Some have a specific indentation or grip area so consider these. You should select a brush with a cable that is long enough to easily maneuver the styling tool and reach between your mirror and the closest outlet. #4. Bristles: When looking for a good hot air brush, be sure to pay attention to the bristles as well as the heating elements. 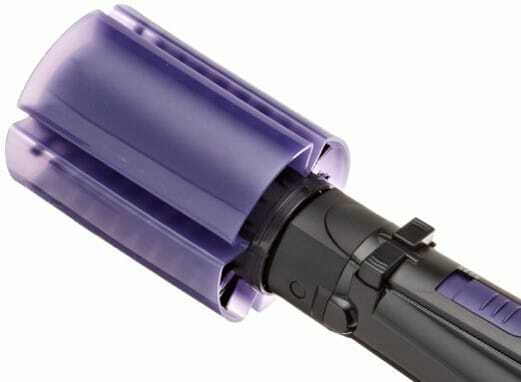 Select a product with high-quality bristles such as nylon since these will not be damaged by the heat from the curler. There are also many different bristle lengths and barrel widths available for hot brushes; choose the one that will create curls of the size you want. If you’ve been thinking about buying a hot air styler but you’re finding it confusing then I hope to help. There are so many hot air brushes and hot stylers in the market; I know how difficult it is to work out what will work for your hair. #5: Revlon Perfect Heat 2"
Revlon just launched its rebellious 2-in-1 hot air brush which acts as dryer and styler in one go. You simply need to brush towel dried hair to dry and straighten at the same time; its soft bristles detangle add shine to the finished style. It is a hybrid between a brush and a straightening iron, used best on dried hair. You can use a straightening brush on hair that is washed and dried and obtains the straightening iron results with much easier and intuitive brushing move. It includes a removable filter which gives more space to clean the lint. Tourmaline Ceramic Technology is used in this. The rotating bristles create styles you desire with ease. It includes a cool shot button with 2 heat settings optimal for any hair type. With tangle free swivel cord it becomes easy to use. While traveling the bristles might tilt, to avoid such scenario a protective cover is offered with the packaging. "Although not quite a traditional hair straightener, Revlon Hot Airbrushes doesn’t deliver “pin straight hair.” Still, it straightens, adds volume and makes hair manageable." 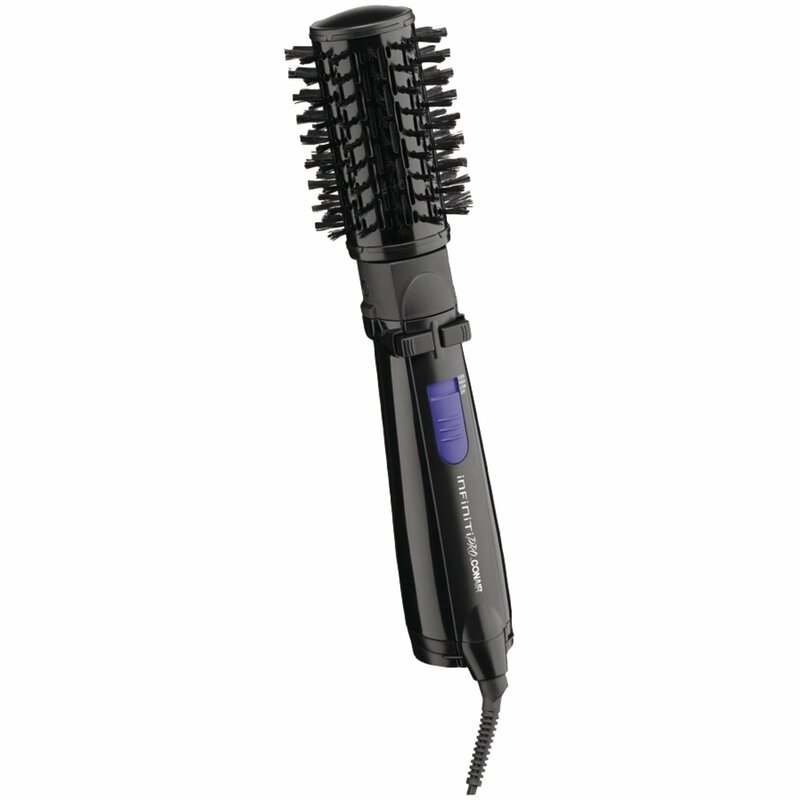 The Infiniti Pro by Conair Spin Air Rotating Styler is very popular among all the styling brushes. Ionic Technology is responsible for making hair frizz-free, sleek and moisturized. Now, with multi-directional spinning rotation achieve different styles using various techniques. Ceramic coating generates 100 times number of negative ions as compared to other hot air brushes. Its 3 heat settings and 2-speed settings can be customized, compatible to your hair styling needs. 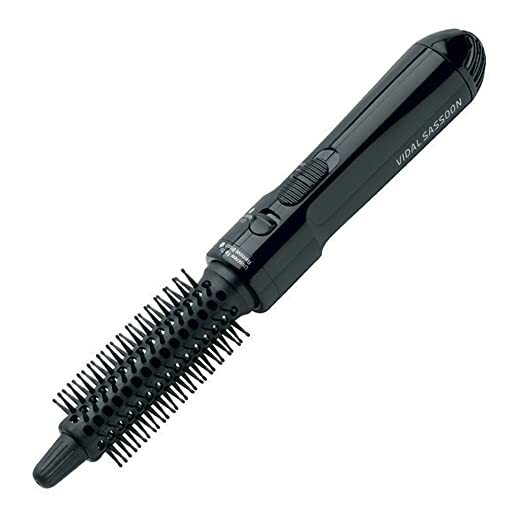 The Conair Infiniti Pro hot brush comes with a cover to protect the bristles from being deformed. Other hair curlers can get their bristles twisted in their boxes, but bristles of Conair hot brush are protected by hard plastic cover hence there’s no chance of twisting. While traveling, this protective bristle cover is quite important. Some say the handle is too big, however, no one likely to use the Conair hot brush for a longer period to experience any discomfort in handling a stout grip, simply because of its fast and convenient. It's much easier to grip bigger handles than thinner ones. It has mechanized rotating bristle which makes your hairstyling faster and more convenient. The switches that control the rotation are quite sensitive, so it will not drag your hair forcibly as they will stop twisting immediately as soon as you release pressure. The removable filter adds up some more space, allowing you easy lint removal to prevent build-up and prolong motor life. "If styling with the ordinary hair curler takes fifteen minutes to half an hour, you will spend 8-10 minutes with Conair Hot air brush." The Vidal Sassoon Hot brush is a slick and compact hair styling tool. It's a round brush, attached to a blow dryer to straighten or curl your hair conveniently with one hand. Your other hand comes in handy to guide your hair as these hair tool brushes through and untangles and dries your hair instantly. The 1-inch barrel provides well enough curls and great volume. The release button prevents the incidence of having your hair entangled in the bristles and relieves the scalp and hair roots of stress from all the pulling and curling. The worst thing that can happen is burning your hairs and scalp. Bristles that get too hot could be on the verge of melting, and you don’t want plastic liquescent on your hair and scalp, as that would create serious problems. While styling the brush collects dirt and oil from your hair, Vidal Sassoon presents removable brush from its main body making it safe and easy to clean. Like the ordinary brush, your brush attachment has to be thoroughly cleaned after few days of usage; being able to detach it from motor unit gives the opportunity to clean it thoroughly like any other ordinary brush. Designed with high/low heat settings Vidal Sassoon Curling Brush has a safety plug that will automatically turn off way before it reaches the point of overheating. The non-slip handle is comfortable to grip and gives you control for easy styling. "In Vidal Sassoon, its bristle tip never gets hot and in turn protects hairs. If you are choosy with colors Vidal Sassoon is available in 3 colors: Pink, Teal and black. This is great hot air brush offering more features than its price tag." Mold your hair with hot brush from experts of John Frieda. This Hot brush houses precocious Ionic Power and gives flock and shine to your hair while it simultaneously dries each strand. Well, rapid heat up fastens drying and delivering high heat doesn’t damage your hairs. There are 500 watts behind the hot air brush where 50% more ions are utilized by advanced ionic technology. It has 2 heat settings and a cool setting. Its barrel is not just Ceramic Coated but its Titanium Coated too and it provides great styling with instant heat. The slightly larger hot air brush is superb for styles that are just little thicker. Further comfort is delivered by its 360 swivel cord, reducing tangles in both hair and hairbrush itself. The twist-free anti-static bristle works through your hair, eliminating the moisture out of each strand and keeping it strong. Well, let me offer you a small tip from my side, 500 watts of power decreases conduciveness of functionality for longer, thicker heads of hairs. "The John Frieda Hot Air Brush is well-balanced for easy movement and handle makes it to comfortable to grip even for a longer period." With the BaBylissPro Nano Titanium’s 2-inch rotating hot air brush, you can dry and style your hair at the same time. Because the Babyliss rotating brush is capable of multi-directional motion, you can dry your hair even in the hardest-to-reach areas and then style it as usual. Its rotating 2-inch barrel does so well in eliminating the frizz caused by static electricity in hair that it helps in bringing out its natural shine. 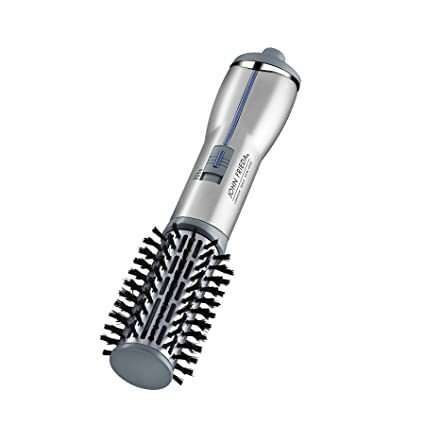 Its Technology of Nano Titanium provides hair with premium negative ions to seal in hair’s cuticles and retain moisture. It has anti-static type bristles that minimize frizz in hair. It has three settings for different temperatures that are suitable for whatever hair type you have. It can straighten curly or wavy hair without damaging because of its use of far infrared heat. It reduces the risk of hand fatigue as well because of its easy-to-use push buttons for control and ergonomic hand-held design. It comes with an eight-foot power cord that can swivel up to 360 degrees to give you great mobility while you use it. 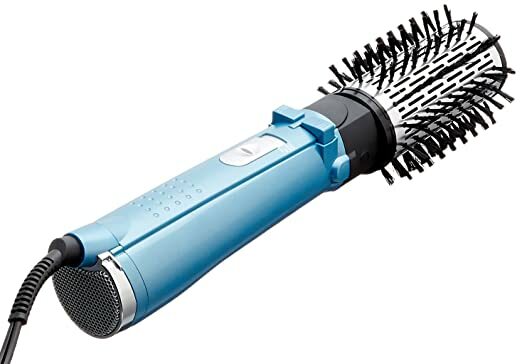 This Babyliss model’s low setting is a combination of ideal heat and air flow that is suitable for drying and shaping color-treated, chemical-damaged or fine hair. The high setting has a combination of a higher degree of temperature and stronger flow of air that is good for drying coarse or thick hair and even for pre-drying all hair types. The cool setting is perfect for adding that long-lasting finish to any hair. The controls for forward or reverse action helps you place the Babyliss into hair sections that are closest to the hair’s roots. You only have to rotate the convenient, 2-inch wide barrel away from your head by pressing either the forward or reverse button and holding it in for a few seconds. Simply release the hair section you have just dried, and it falls gently into place. "In your choice of blue or red color finish, this tool does not require any additional hairstyling product to give you healthy-looking hair except perhaps a few comb-overs or a spray of mist." Here we come at the end of the list of 5 best hair brushes. Looking at the list, every brush is unique in its way making you look beautiful on every other occasion. The dual task of drying as well as styling the hair at the same time makes it a desirable accessory in your wardrobe. So, all those girls who wish to look classy; every day you step out of your house, the hair brush will do it all without making things complicated. I hope my review helped you in clearing all the possible queries a wise woman asks for which will, in turn, help you pick the best hair brush for you. Choose on, and keep rolling girls!